Here at Stanhope Park Veterinary Hospital we are passionate about providing a high standard of care to ALL of our patients. That includes our scaly, feathery and small furry friends. 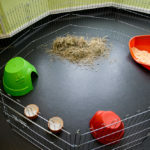 Small furries such as ferrets, rabbits, guinea pigs, chinchillas, and rodents such as hamsters and rats, have been popular pets for many years, as well as avian birds such as parrots, budgerigars and cockatiels. In recent years, more exotic species such as lizards, snakes and terrapins, have proved increasingly popular as pets in the UK, and we are now commonly encountering these fascinating scaly creatures on a regular basis. At Stanhope Park Vets, we pride ourselves in being a forward-thinking veterinary hospital, so a couple of years back, we created a reptile ward on the first floor at our Stanhope Road Hospital, as we recognised how popular scaly pets were becoming, and we wanted to extend our services to provide for the needs of all pets. In October 2016, we were delighted to open the doors to our new Cats and Exotics Branch on Duke Street – literally a stone’s throw from our Stanhope Road Hospital, but a completely separate building, allowing us to provide a uniqu e dog-free zone for cats and exotic species. We are also very honoured that we have been able to achieve “Silver Grade” on the RWAF (Rabbit Welfare Association and Fund) list of Rabbit Friendly Vets – of which there are just a handful in the entire North-East region! 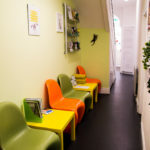 At our Duke Street Clinic, we have two separate waiting areas – one for cats and one for exotics. This helps to reduce stress between the different species whilst waiting for appointments by minimising sight, sound or smell of each other. When you arrive at the surgery, you will be invited to place your pet’s basket or cage on one of our tables in the waiting area, where your pet will feel less vulnerable as they will be able to observe their surroundings from a height. We have a supply of clean towels in the waiting area (pre-sprayed with Pet Remedy) which you will be invited to drape over your pet’s basket whilst waiting for your appointment, which can help to settle anxious pets, and this may then be taken through to the consulting room to provide a soft and comfy surface to sit on for their examination. We also have a Pet Remedy diffuser plugged in in both the waiting area and consulting room – this comprises a natural blend of essential oils and valerian, which works on a variety of species alongside their natural relaxation pathways to help promote calmness and reduce stress and anxiety. Our dedicated small mammal and bird ward at our Duke Street Clinic, is completely separate to our cat ward and reptile ward to provide our small furry and feathered patients with a relaxing, stress-free environment away from the sight, sound and smell of predators. Our range of stainless steel kennels are easy to clean and disinfect to prevent cross-c ontamination between patients, and we have a variety of hides, litter trays and substrates to provide a safe and familiar enclosure for your furry friends, along with an extendable run to allow exercise in a safe environment. We also have a range of cages for birds and smaller rodents such as hamsters, making us fully equipped for the huge variety of species we see on a regular basis. Again, we have a Pet Remedy diffuser plugged in at all times in the ward to help reduce stress and anxiety for our hospitalised patients. 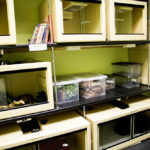 Our dedicated reptile ward at the Duke Street Clinic is fully equipped with state-of-the-art vivariums in a range of sizes to suit all reptile species commonly kept as pets. Each vivarium has its own thermostatically controlled heat source along with ultraviolet lamps on electronic timers to provide an appropriate environment for the individual species to safely recuperate during their stay. A range of artificial plants, hides and rocks will also be offered to your scaly friend to ensure they can hide away and feel safe in their unfamiliar surroundings to reduce stress and fear. Our modern operating facilities have also been designed with our smaller patients in mind. 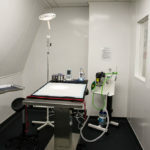 Our theatre boasts a heated table top to help maintain body temperature during surgery, as anaesthetised patients are unable to self-regulate, and small patients such as bunnies, rodents and birds lose heat much quicker than larger animals, leaving them vulnerable to hypothermia. We can perform most surgeries at the Duke Street Clinic, however, more complex surgeries or procedures requiring imaging diagnostics such as x-ray and endoscopy, would be carried out at our main hospital on Stanhope Road. We have a range of anaesthetic agents and anaesthetic and surgical equipment specifically for the various species we treat, enabling us to provide a tailor-made anaesthetic protocol suitable for your individual pet. Practice Principal Micaela Wright has always enjoyed treating small furries and birds, as well as wildlife casualties, and is currently developing her knowledge and interest in reptile patients, and will be happy to see all of your exotic pets for consultations, whilst several of our other veterinary surgeons also have a keen interest and experience of treating exotic species. Laura Beahan RVN and Pippa Young SVN, are both experienced reptile keepers with a keen interest in exotic species, and Laura is currently undertaking further studying in this field. They would be happy to help with any general husbandry queries, which are frequently a cause of many of the health problems we see, especially in reptiles. For such general queries, please email our Cats and Exotics clinic at cat.reception@stanhope-vet.co.uk. 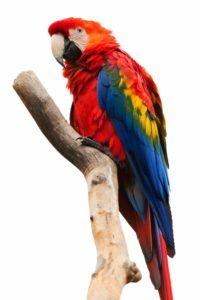 Our Exotics Healthy Pets Plan offers an affordable solution for owners to provide routine preventative health care for their exotic pets. Click here to download an Exotics Healthy Pets Plan brochure. 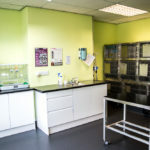 At Stanhope Park Vets, we are very proud to be able to offer these facilities to our exotic friends, and have already seen a huge reduction in stress levels in our small furry patients visiting the practice, be it for a routine health check, nail-clipping or booster vaccination, or when staying with us for a surgical procedure. Whilst many of our long-standing clients may be happy to continue to visit our Stanhope Road Hospital, we would encourage owners to use the new Duke Street clinic whenever possible, as the benefits to your pet can only be positive! We look forward to seeing you and your furry, feathered or scaly friends! For more information on exotic patients, or to book an appointment with a member of our knowledgeable veterinary team, please call 01325 620968 or email Stanhope Park Veterinary Hospital at info@stanhope-vet.co.uk.